“Delegates came from every state in Australia. 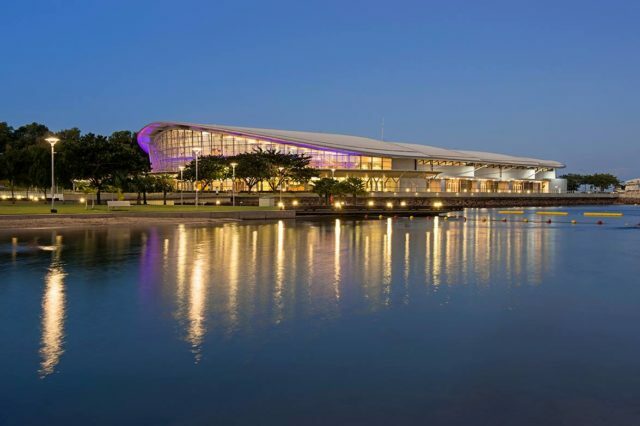 We hadn’t done an event in Darwin for a while and we didn’t know what to expect— but we far exceeded our target” said the conference organiser, Cameron Armstrong of Essential Experiences. “The atmosphere in Darwin relaxed people, and they were able to socialise”, he said. “When we’ve run the event in hotels, you can be a bit segregated and your trade area limited to a foyer space or smaller ballroom somewhere. Or in a big city, you start to lose delegates who want to go off to a restaurant on the other side of the city. Having everything in one location in Darwin this year just made RMA that little bit more special,” said Cuzens. “Darwin’s relaxed and friendly atmosphere gave our conference a laid-back feel”, said the organisers. “The Property Congress in Darwin was a great networking opportunity and a fantastic way to discuss the topical issues affecting our industry”, one delegate said. “There were plenty of networking opportunities, and the events were fun and well run. Also the weather could not be better” said another.